A fairy light flits against the curtain as it rises on a scene of Kensington Gardens circa 1904. "Welcome to London!" sings the ensemble, whirling on and off the stage as nannies push prams, ladies gossip, children gallop, and playwright James Barrie snags an open park bench in search of inspiration. 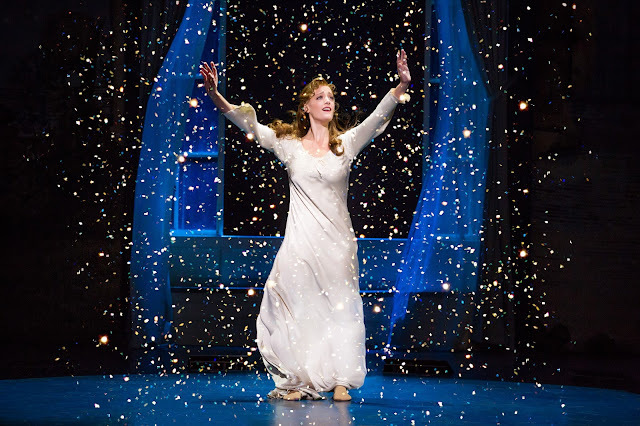 That inspiration is at the core of Finding Neverland. It's the story of how Peter Pan's author, J.M. Barrie, gets inspired by a family of four darling boys and their high-spirited mother, Sylvia, to create one of the most beloved characters in children's literature. To tell a story chockfull of pirates, pixie dust, mermaids, thimble kisses, rogue shadows, dog nannies, and kids in flight, a sense of magic and enchantment is a must. 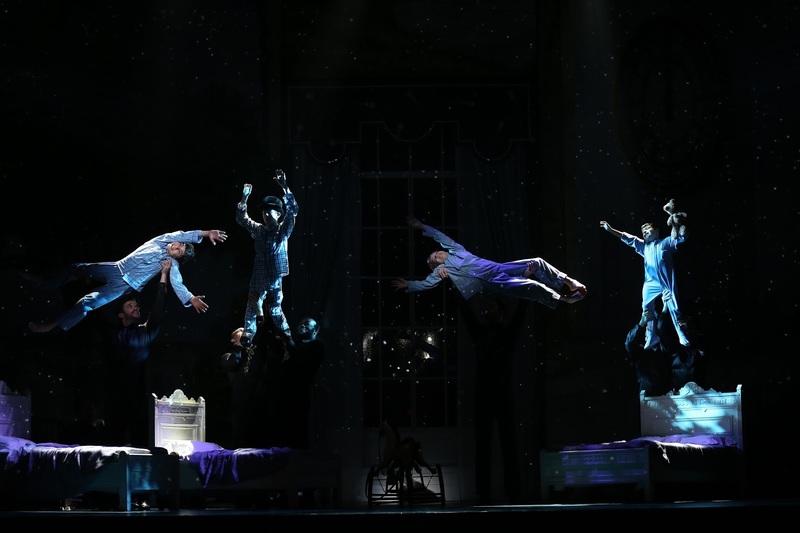 For the most part, Finding Neverland pulls through in awakening that sense of childlike wonder, especially in its bright, illustrative sets and moments sprinkled throughout the show that dive directly into Barrie's imagination. For instance, at a dull dinner party, the mirthless adults remain frozen in time as James, Sylvia, the children, and the waitstaff clown about singing "We Own the Night." Another such moment comes after a day of make-believe in Kensington Gardens, as Sylvia and James attempt to tuck the riled-up boys into bed. "I won't go to bed, I won't, I won't!" the littlest, Michael, gleefully shouts. As the brothers bounce on their beds, James imagines them flying. And once again, when Barrie begins to lose his way, his imagination springs to life in the form of the scalawag Captain Hook. These moments always come just in the knick of time to inject another dose of playfulness into Finding Neverland. For though the sets are picture perfect, the costuming exquisite, the choreography of Broadway caliber, it's in the songs where this musical, sometimes, falls flat. The score is triumphant, filled with power ballads and pop-style tunes — but they're just not terribly catchy or memorable. That, and some of the lyrics and phrasing feel a bit out of place and time for a musical set in 1904. But what saves the otherwise-forgettable songs in this Finding Neverland national tour is the incredible — and consistent — talent on stage. Will Ray who plays Barrie also played Valjean on Broadway, so that certainly speaks to the caliber of his vocal ability and range. He nails every note. John Davidson acts as both Barrie's producer, Charles Frohman, and the Captain Hook of Barrie's imagination. His is a crowd-pleasing performance, full of laughs. But in terms of voice alone, none surpass Lael Van Keuren as Sylvia. Her big song, "All That Matters," is made memorable thanks to her soaring, life-giving instrument. What a joy to behold. The four young boys in the cast also keep pace with the grown-ups. In Act Two, their sweet washboard-and-ukulele song, "We're All Made of Stars," is a charming, lighthearted little ditty made all the more amusing by these four young fellows. 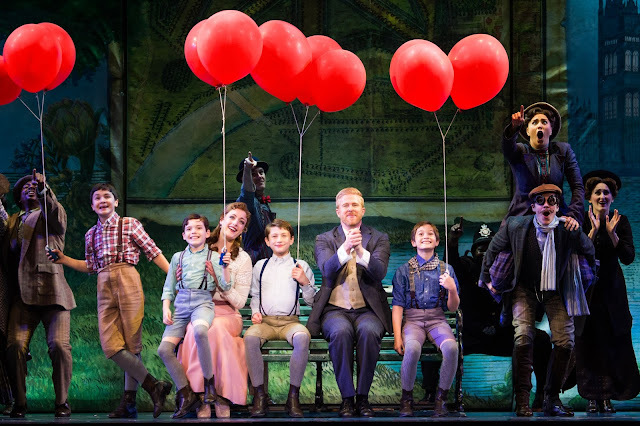 It would be nice to see more of that from Finding Neverland — the chance to really let the children, and just the children, shine. But it can't be denied that there are shining moments aplenty in this Pan-themed spectacular. Again, the choreography is remarkably well-crafted and perfectly executed by a brilliant cast of characters. Especially unforgettable is the way in which Sylvia goes to Neverland in a flurry of sparkle and light. It's absolute magic, and moments like these make one sigh and revel at the splendor of what's possible at the theater. 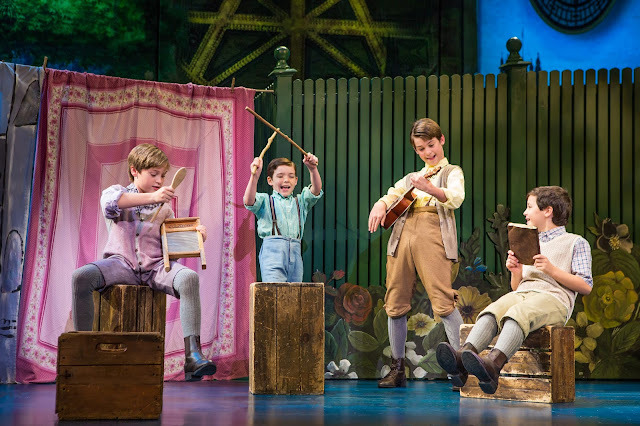 That sense of appreciating the idea of a play and its infinite possibilities — that's an essential truth in Finding Neverland. It's an invitation to search your imagination, unlock the child within, and embrace the way in which a playful nature makes it possible to survive even the darkest of times. A bit of imagination and silliness go a long way, and there's enough of each in Finding Neverland to take you "straight on 'til morning." Cookie bars and brownies are a no-brainer when it comes to bringing a sweet to share. But when charged with dessert at a dinner party where the hostess avoids gluten, what's a baker to do? After a light google, a King Arthur Flour recipe for gluten-free almond flour shortbread cookies quickly became the winner. With just five simple ingredients and a bake time of 8–10 minutes, it was a fairly easy choice. You can flavor these little gluten-less nuggets with almond extract, vanilla, or even lemon. I doubled the recipe and divided my dough in two for half almond, half vanilla. 1. Preheat the oven to 350 degrees. Line a baking sheet with parchment paper. 2. Mix all of the ingredients in a bowl until a cohesive dough forms (I used a fork, then switched to my hands). 6. Remove cookies from the oven, and cool on the pan for about 10 minutes before transferring to a wire rack. Before serving, I dusted the vanilla cookies with a little powdered sugar, just for prettiness. The amounts of vanilla and almond extract are for one batch of cookies. So if you double the recipe and divide the dough in half to make two flavors of cookie, you'll still do a 1/2 tsp of vanilla extract in one half of your dough and 1/8 tsp of almond extract in the other half of your dough. Almond extract is much more potent than vanilla, which is why a little goes a long way. By doubling the recipe, I got about 24 cookies — and I'm happy to say they were all gone by the end of our four-person, gluten-free dinner party. Sounds like too many cookies for four people in one evening, but these babies are really adorably tiny — and addictive. Perfect little morsels, whether you're eating gluten or not. I'll tell you right now: This isn't your average theater review. I saw Equivocation at Next Act Theatre over a week ago now – on a night when I was actually starting to come down with something rather flu-y. That bug knocked me flat on my back for a number of days, and I'm still fighting to get 100% over it. 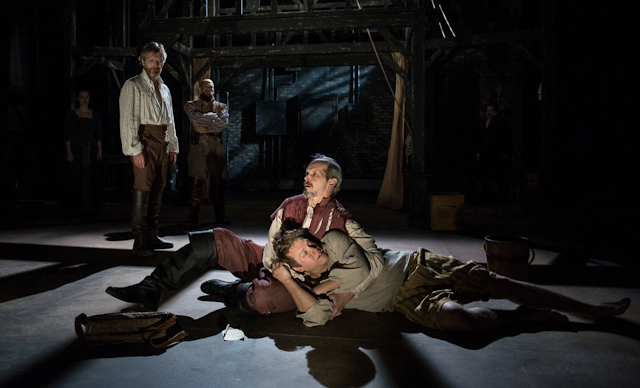 So forgive my humanity, but I'm exhausted at the thought of writing a standard review for Bill Cain's brilliant Equivocation. That said, I simply couldn't let this show pass without shouting its praise — even in an unconventional and more candid way. 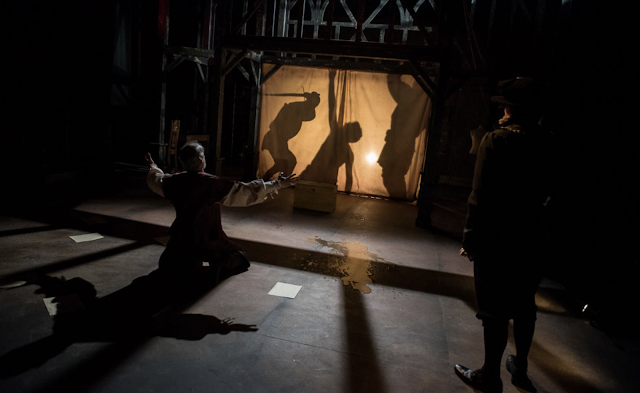 Here are four reasons Equivocation is a must-see. 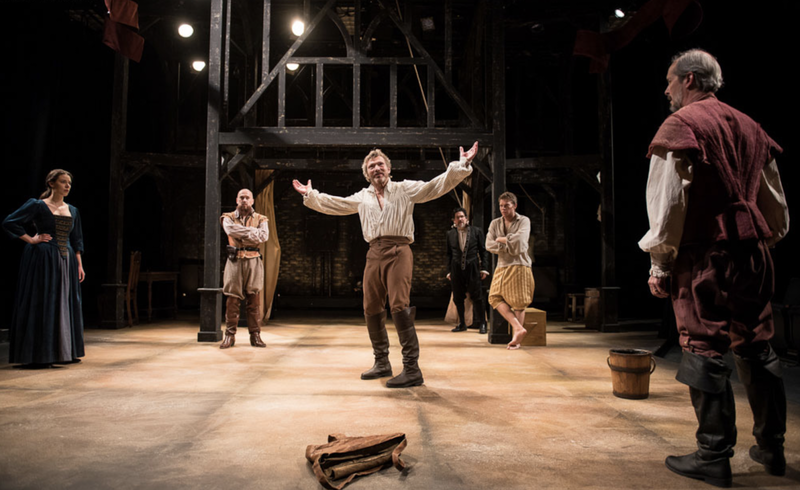 #1 If you're a fan of Shakespeare, history, and/or politics, get thee to Equivocation! This show is entirely too complicated to explain beyond this Next Act summary: "William Shakespeare is commissioned by Sir Robert Cecil, the most powerful man in England, to write the true history of the Gunpowder Plot — a failed attempt to kill King James I. But as Shag and his actors rehearse their new play, they suspect the government’s version might be a product of 'alternative facts.' Now, the greatest writer of all time must decide between writing a lie and losing his soul, or writing the truth and losing his head." If that sounds up your alley, you gotta go. I admit, all the politics aren't necessarily my cup of tea, on paper. We get enough of that in real life, and I don't always relish seeing it at the theater. I'm more of an escapist. However, I was riveted by this story. It's an almost three-hour play (gasp!) but it simply zooms by. I don't know how, but it does. It's amazing. #2 The cast is uniformly incredible. I can't remember the last time I've seen a group of actors ooze such natural camaraderie in an ensemble cast. Nothing about these performances feels forced — the chemistry is genuine, and the individual talent of each actor is undeniable. I want to give each and every one of these phenomenal people a shout out, as they truly blew my mind, but I'll limit myself to two in particular. Jonathan Smoots, whose voice is so commanding, he's like our very own Gandalf. Please read me the phone book, Jonathan Smoots. I will listen with rapt attention. And I've got to give it up for Josh Krause, who nailed his various characters with such flow and emotion — he is absolutely spellbinding. But then again, they all are. #3 This is the most theatrical show I've seen at Next Act, period. The set is grand. The experience is immersive. The lighting, staging, and effects are a marvel for a space and theater as intimate as Next Act. This is some world-class dramatization, and it's happening on a (relatively) tiny stage right here in Milwaukee. If really, really good theatrics light your fire, you gotta go. That said, a word of warning: Equivocation isn't for the faint of heart. It's brutal at times, can be graphic in its language and imagery, and there's at least one squirm-worthy sexual situation. Mature audiences welcome. Youngsters, not so much. #4 It's the final week — and Monday is pay-what-you-can night! 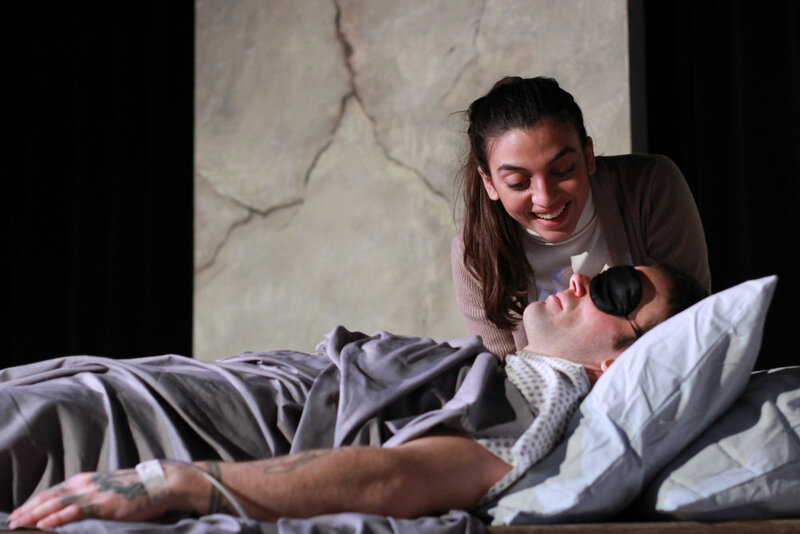 Equivocation runs until February 25th. Monday, February 19th, is pay-what-you-can night. Tickets go on sale at 6:30pm, and the show starts at 7:30. I cannot emphasize enough how very worth your time it would be to take advantage of such a deal. Hands down, this is one of the best things I've seen on a Milwaukee stage this season. 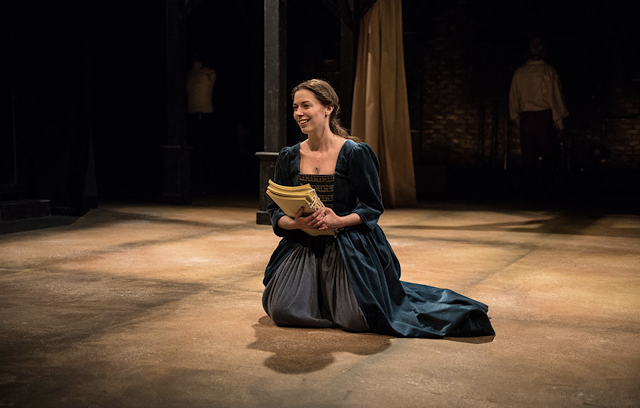 Friends, you have one week left to see the gripping, unforgettable Equivocation at Next Act Theatre — just go do it already! 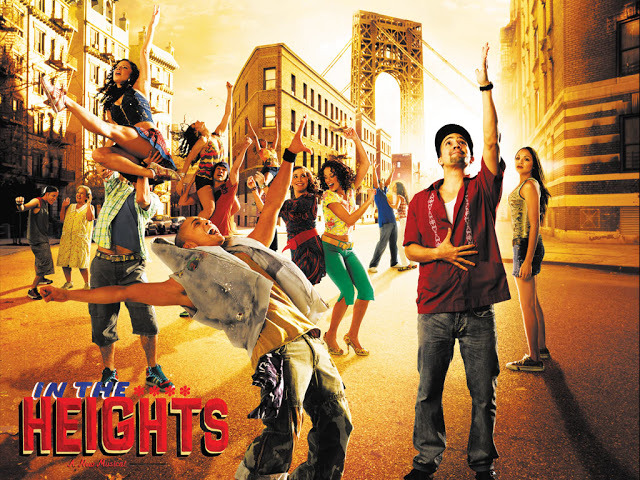 Lights up on the Milwaukee Repertory Theater, where the big news for the 2018/2019 season is no doubt the six-time Tony Award-winning musical In the Heights. The show, which opens September 18th, blends salsa, merengue, soul, hip-hop, and R & B, and was the first Tony Award-winning musical by Hamilton creator Lin-Manuel Miranda, back in 2008. It's a story of chasing dreams, finding home, and it's all set to music that makes you want to move your body. Other stand-out plays include Ayad Akhtar's Junk, fresh off its Broadway run at Lincoln Center. It's set in the financial world of the 1980s, and yet somehow manages to be highly entertaining, allegedly. For the Austen fans in the audience, the holiday season brings Miss Bennet: Christmas at Pemberley to the Powerhouse stage — a continuation of Pride & Prejudice that centers on the bookish and often-forgotten Mary, the middle Bennet sister. Not part of the Rep subscription package, but exciting just the same, is Every Brilliant Thing in the Stiemke Studio next April. It's a one-man show about a young boy who eases his mother's depression by listing everything worth living for — everything from Star Trek to ice cream to a good hairdresser. The Rep says "it's a testament to the power of storytelling and a reminder that hope is never truly lost." Then in the Cabaret (which will be newly-renovated next season), there's Songs for Nobodies — a one-woman show about 5 everyday women and their encounters with five renowned divas (Judy Garland, Patsy Cline, Edith Piaf, Maria Callas, and Billy Holiday). There's also Mark Twain's River of Song, which promises American folk classics from the wonderful David Lutken, and The All Night Strut! — a review of 1930s and 40s favorites. Wrapping it up in the Cabaret is Ring of Fire: The Music of Johnny Cash. The last time the Rep staged this show, it sold out its entire run, even before opening night. So if Johnny Cash is up your alley, snag your tickets early — or maybe even subscribe. For a full list of the 2018/2019 season at the Milwaukee Rep, visit milwaukeerep.com. Skylight Music Theatre presents "Zombies from the Beyond"
The Milwaukee Space Center, circa 1955. A tacky, football-sized UFO on a string. Aliens dressed in drag. Searing operatics and maniacal laughs. A tap dancing delivery boy. A Russian spy. Lines like "I always enjoy catching up on the latest dance sensations, especially during a hideous crisis." Cartoonish to the last. 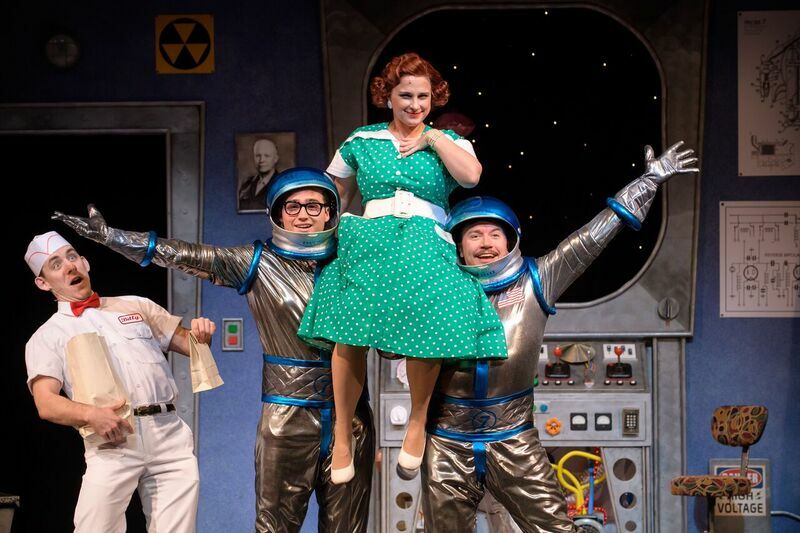 The entirety of Skylight's Zombies from the Beyond is a tongue-in-cheek romp chockfull of 1950s space fascination and Cold War paranoia, with each moment played for lots of laughs and loads of kitsch. 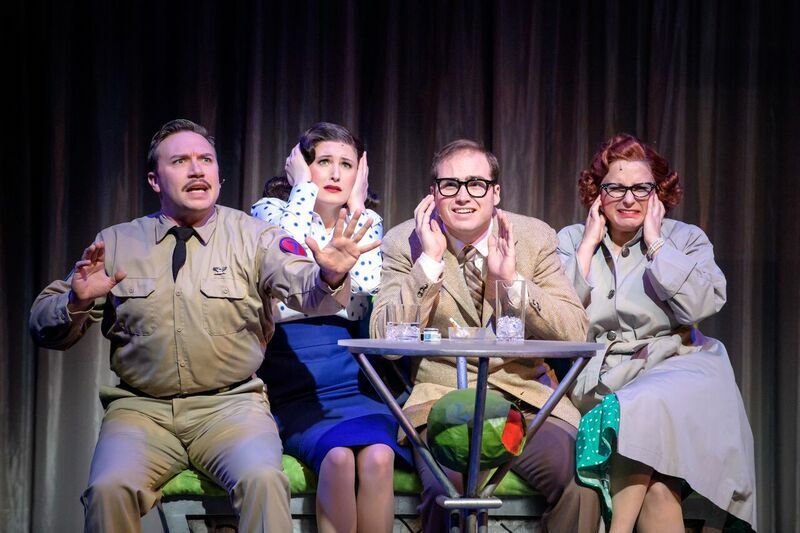 The musical kicks off with a disembodied voice, mimicking a model mid-century newscaster: "Outer Space... Since the dawn of time immemorial, man has probed the vast expanse above him in search of another planet capable of supporting intelligent life-forms." Like a real 1950s space-horror flick, opening credits are projected to a fanfare of theme music, as a pink toy UFO whizzes across the stage on a miniature zip line. The farcical tone of Zombies, written by Milwaukee native James Valcq and directed by Pam Kriger, is set. 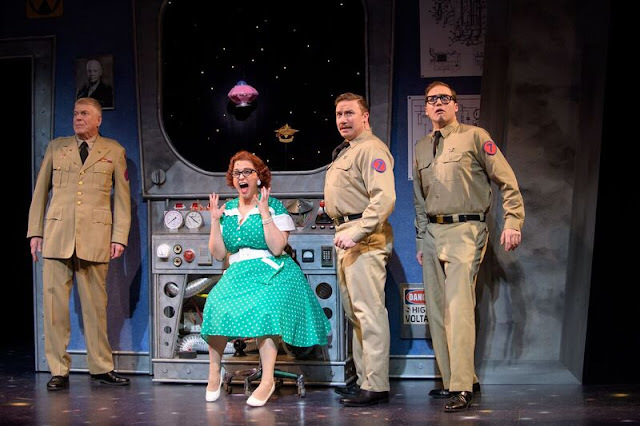 Enter the fine men in uniform at the fictional Milwaukee Space Center: Major Malone (the ever-remarkable Norman Moses), second-in-command Rick Jones (the marvelously dexterous Rick Pendzich), and stuffed-shirt rocket scientist Trenton Corbett (the spot-on Matt Frye). Rounding out the space center crew is delivery boy Billy Krutzik (the twinkle-toed Joe Capstick), man-hungry secretary Charlene Osmanski, AKA Charlie (the hilarious Meghan Randolph), and the Major's daughter, Mary Malone (the lovely and witty Kathryn Hausman). The part of Mary is a classic 1950s trope: "My place is to take care of my father, not to tinker with rocket ships," she says. But, in addition to bringing Dad lunch at the Space Center, Mary is also an amateur photographer who dabbles in deep space astronomy, speaks Russian, and is a regular whiz at Morse Code. Hausman leans into the deadpan humor of Mary's many "Oh, Dad..."s and alternate super-smart "Jinkies! "-type moments to charming and chuckle-out-loud effect. But back to the control room. The group is gathered to launch a rocket to snap the first photos of the sun. In a twist of fate, the live footage instead shows a flying saucer, headed straight for Milwaukee's own Galaxy of Coiffures Beauty Salon. Gasp! And to top it off, Mary and Trenton's budding romance is put in jeopardy. Oh the humanity! Hijinks unfold in catchy tunes and clever writing. 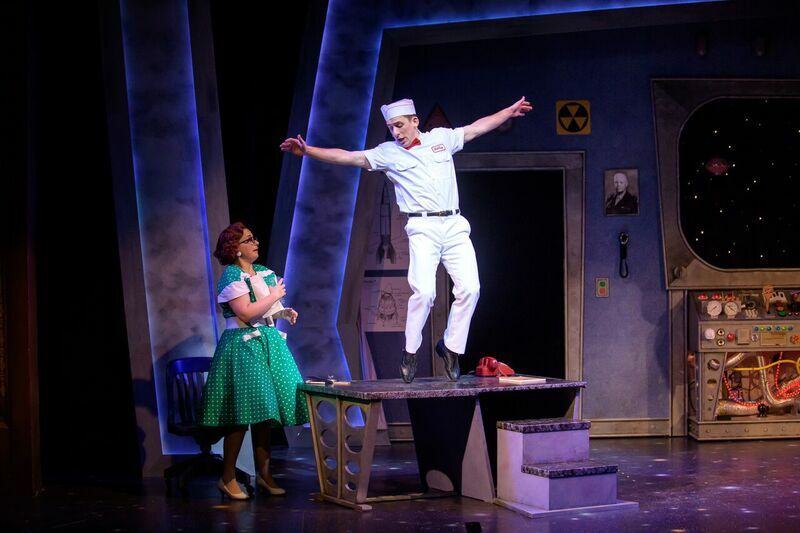 Between Meghan Randolph's shimmying, kick-lining "Blast Off Baby" and Joe Capstick's show-stopping, lighter-than-air tap number, "Atomic Feet," it seems Act One of Zombies has delivered its share of musical entertainment — and the great Zombina hasn't even landed yet. Zombina, played by the utterly sensational SaraLynn Evenson, lands her pink UFO just before intermission, and her arrival takes Zombies from the Beyond from great fun to pretty darn incredible. Evenson embodies a cackling, crazed super villain whose source of power is her otherworldly voice. A deliciously evil diva, Evenson slays the role with her always (truly — always) pitch-perfect soprano, straddling funny and ferocious with remarkable ease. To give away any more secrets and silliness would be a disservice to this surprising musical spectacular. Zombies is best experienced with a crowd of folks who laugh easily, applaud readily, and who can appreciate a night of theatrical merriment, rather than morals. Serious talent aside, there's little (if any) seriousness to be found in Zombies from the Beyond, and hardly a noble message to ponder — but that doesn't make it any less out of this world. The Constructivists present "Gruesome Playground Injuries"
"Our throw-up's all mixed together," says Doug. He's staring into a trash bin in the school nurse's office circa 1993, his expression that perfect pre-teen boy mix of grossed out and super stoked. Kayleen in her spandex shorts, floral jumper, and half-up scrunchie hairdo wants to see. She may repeatedly call Doug "disgusting," but she can handle more than her share of mixed-up throw-up. That's kind of what Rajiv Joseph's Gruesome Playground Injuries is all about: Two people and the simultaneously cringe-worthy and fascinating ways in which their messy lives get all mixed up. Doug (the feisty Rob Schreiner) and Kayleen (the pitch-perfect Solana Ramirez-Garcia) meet in the school nurse's office as children in 1988 — Kayleen has a stomach ache, Doug fell and "broke" his face. They meet back there again during the throw-up incident of 1993, where the two evade the middle school dance and a best-friendship is born. The scenes jump back and forth through time, bouncing from elementary days to Kayleen's father's funeral in 2003, a hospital room in 2013, and a final snapshot of the two protagonists in 2018, with some years visited on more than one occasion. The leaping about through time really ups the intrigue, as plot holes are slowly filled in and questions answered. Are there still more questions as the two take their bows? Yes — but that's the beauty of it. Whether an optimist or realist, Gruesome Playground Injuries delivers. This debut production, directed by Jaimelyn Gray of Milwaukee's new company The Constructivists, embraces the relative simplicity of the play's material. This isn't a story that requires grand sets or costumes — rather, it's relatable and, though messy and heavy at times, is peppered with humor and is never so overly dramatic to the point of unbelievable. 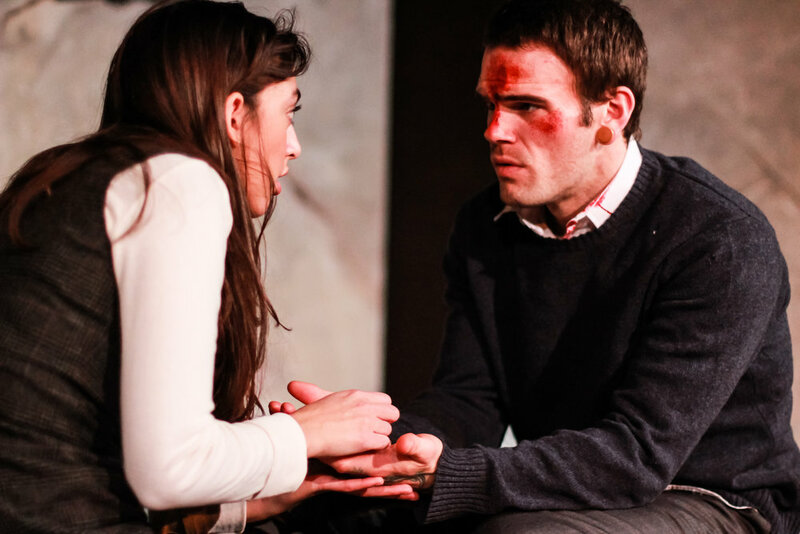 It's a real-world story of two people falling in and out of each other's lives, and a stripped down set with on-stage costume changes hits the nail of raw reality right on the head. The actors themselves share phenomenal chemistry — something that, if lacking, would have completely derailed the production. But Schreiner and Ramirez-Garcia commit to Doug and Kayleen — Schreiner being the goofy, headstrong, and lovable one; Ramirez-Garcia being plenty fiery, yet beautifully tender and vulnerable. Ramirez-Garcia is especially stirring in her more emotionally-charged scenes, and yet the simple way she asks Doug "Does it hurt?" over the course of their injury-ridden lives leaves an equally poignant mark. Though, in the end, it may feel like there's a tiny piece of the puzzle missing (more from the best-friendship years would be nice, perhaps), watching these two play off each other so brilliantly makes up for any lingering questions. At 90 minutes without an intermission, this is a wonderfully well-written piece of theater, and one that's a worthy kick-off for Milwaukee's new Constructivists. 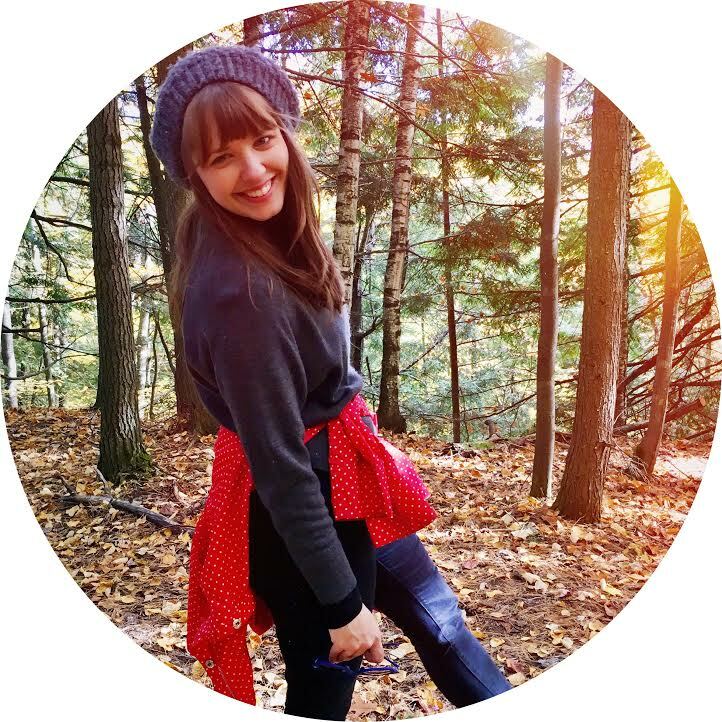 Artistic Director Jaimelyn Gray says this play captures the kind of the work they hope to produce: "Funny, quirky, sad, with a mess of emotion."